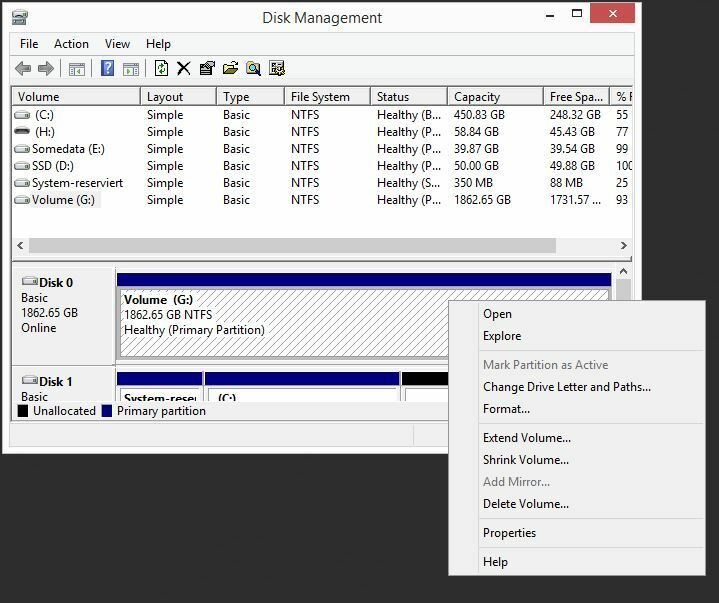 In this tutorial, we are going to mount an additional hard drive in Windows. As you may notice, we will do so in Windows Server 2012, but the procedure is basically the same with Windows Server 2008. 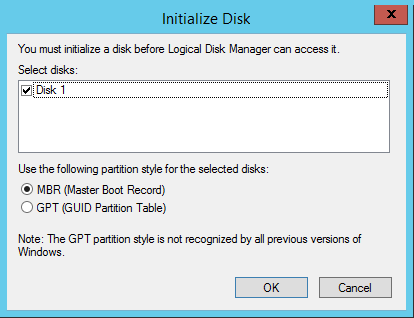 For volumes smaller than 2 TB, we choose MBR, for larger disks, we select GPT. 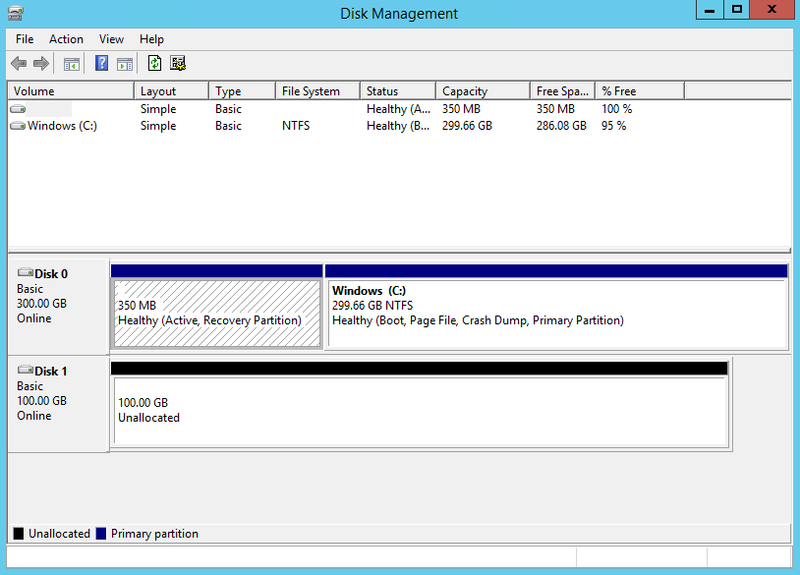 As the hard drive in our example only has a capacity of 100 GB, we'll go with MBR here. 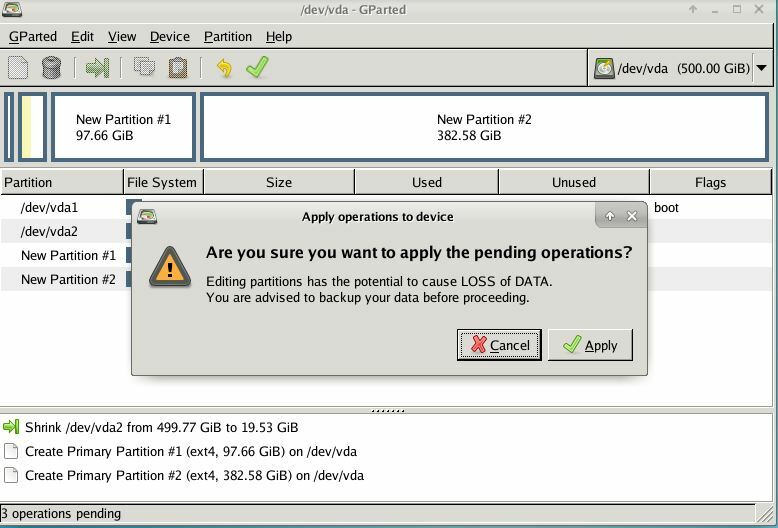 By clicking OK, the chosen partition table will be written to the hard disk. After that procedure, we will be sent to the main menu of the Disk Management service. 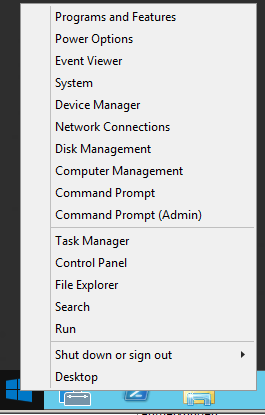 Alternatively, one can reach this overview via Control Panel => Computer Management. As we can see here, our new hard drive is listed as Disk 1. 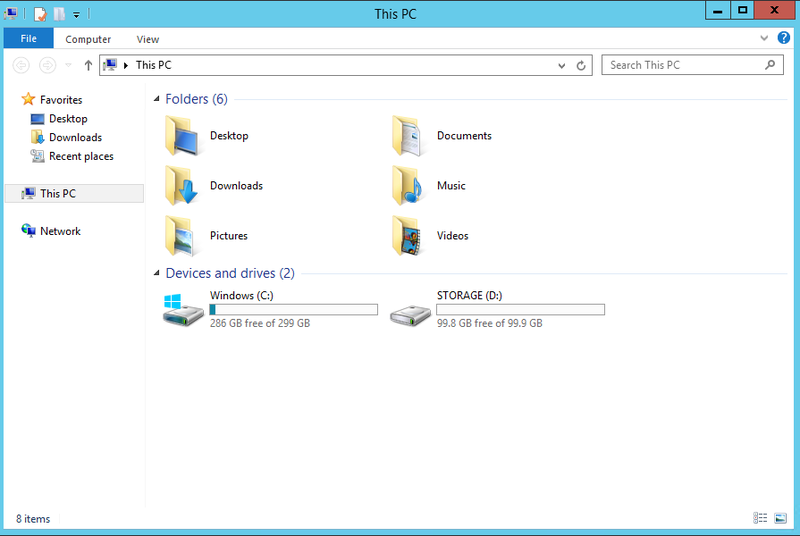 But before we can use it for storing data, we need to partition and format it. 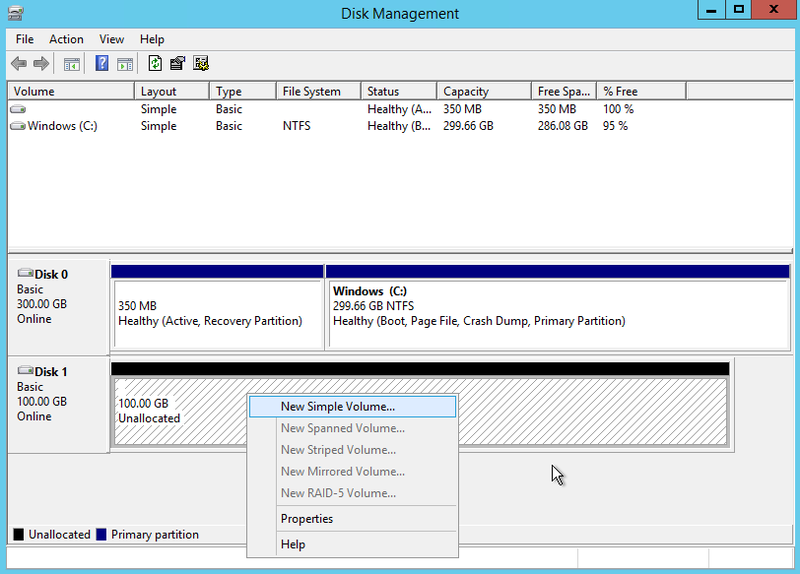 Therefore, we right-click the rectangle next to the box which says Disk 1 and choose New Simple Volume. A wizard opens. It is quite self-explanatory and you can't do anything wrong by using the pre-selected and suggested values. 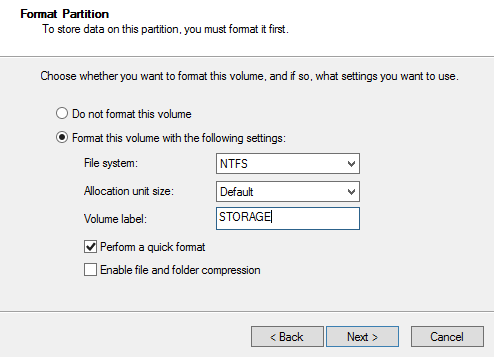 Per default, the wizard uses the whole disk capacity for the new partition and formats it with the file system NTFS, which is recommended for Windows. Of course, you are free to change those settings, but in our example, we go along with them. 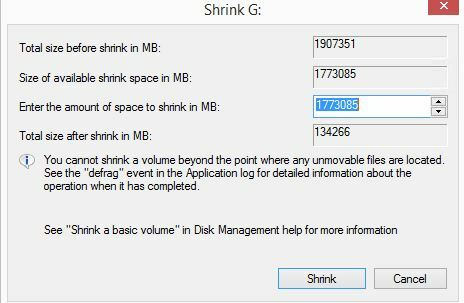 The name of our new partition is STORAGE, but of course you can name it as you wish. New VPS offers: Higher performance, SSD boost! After months of development, the time has come: Today, our entire lineup of VPS offers has been updated. 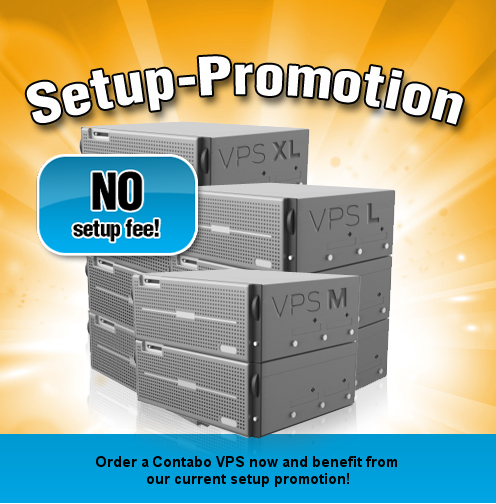 Each Contabo VPS now provides much more performance - at the same price as before! What does this mean for you? More CPU cores, more RAM, more disk space and, for the VPS XL, a Gbit/s uplink. While our previous VPS offers did not have to fear the comparison with dedicated servers, this is even more true for the new Contabo VPS, which are superior to a lot of dedicated servers. Moreover, all VPS have received the new SSD boost feature: Every Contabo VPS is now equipped with SSD acceleration per default. By using SSDs, the I/O performance (IOPS and bandwidth) of your virtual server is improved massively. Databases and other applications which require I/O to perform best are accelerated significantly by the SSD boost. Lags when accessing or writing data are a thing of the past now! Only 7.99 EUR / month! 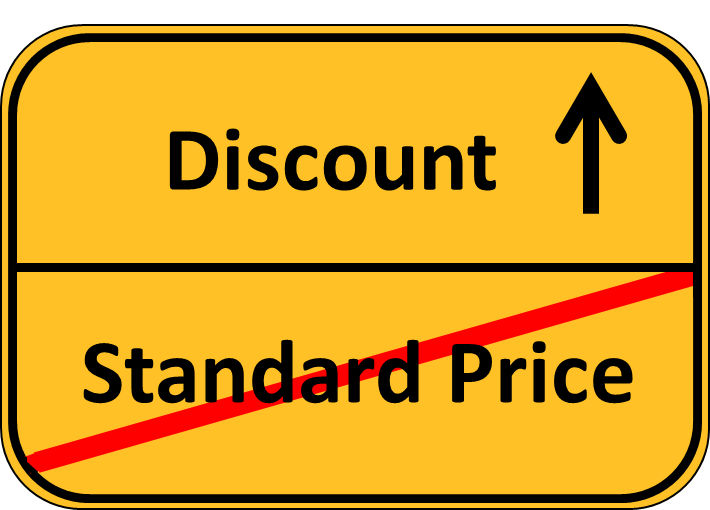 This week only: 0,00 EUR setup fee! only 13.99 EUR / month! Only 24.99 EUR / month! Highspeed-support, high-end systems, lowest prices: What are you waiting for? Get your new VPS now! Virtual Private Servers now almost for free! Once again our technicians have been working hard to improve the price-performance ratio of our popular virtual private servers (VPS). Although thousands of customers worldwide already trust in our services and rent virtual servers from Contabo, we do not rest on our laurels. There's still this one goal. We simply want to be the best. The result of our improvements: more performance, even more reliable servers - at a monthly price that is unbeatable on the hosting market. Contabo Virtual Private Servers (VPS) - now more performance for even less money! Setup fee starting with 0.00 EUR! If you run your own virtual or dedicated server, chances are that you want to run a specific program or a number of programs that make up the service you want to use or offer. 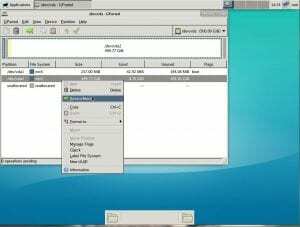 If the program you want to run is part of the Linux distribution of your choice there usually is not much more to it than installing the package and configuring the program. 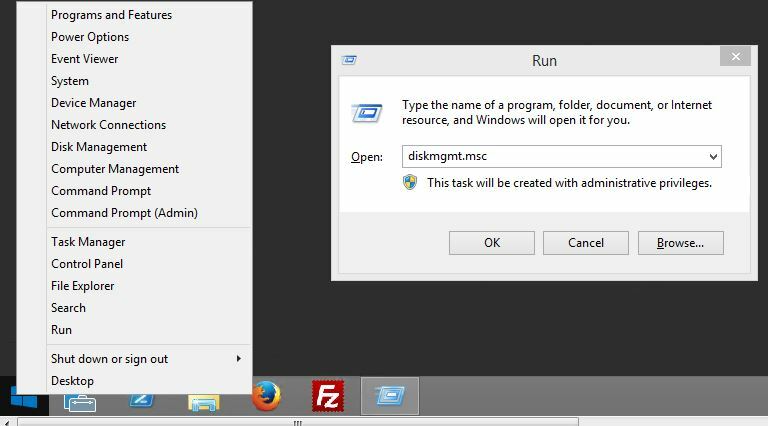 However, if the program comes from an external source or you are writing it yourself, you need to make sure it is started automatically when the server is booting. Additionally, during development or early testing phases of your own program, there might be errors in the code leading to a crash of your application and you might want to make sure that it gets restarted automatically in such a case. A few years ago, the solution to the first issue was quite simple. All you needed to do was to create an init script that would then handle the starting and stopping of the server. 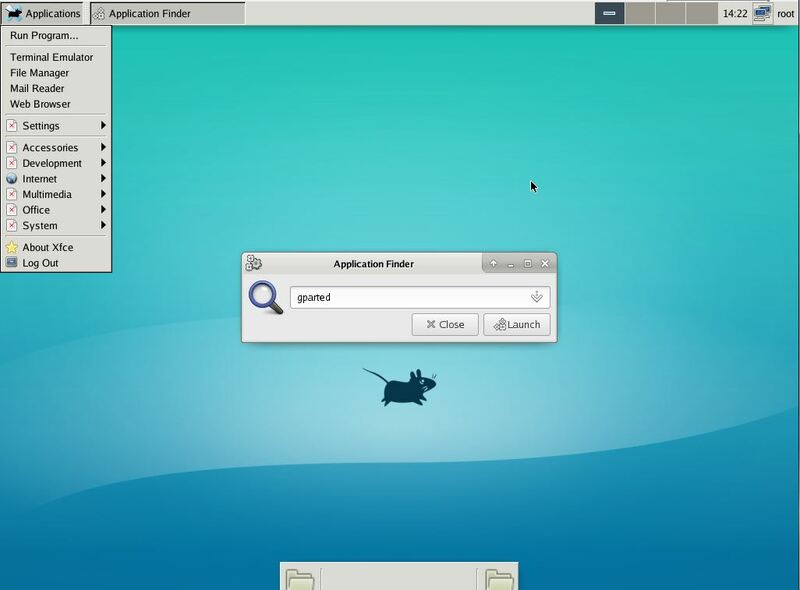 However, recently many Linux distributions changed the way they handle the boot process. Some are still using init, others may be using upstart or even systemd now. Providing the files necessary for all of this systems can be quite a hassle and while upstart and systemd support restarting programs on unexpected termination, implementing this with init is possible but requires to change init's configuration itself. For my own needs I have become attached to using supervisor for this task - the program and the documentation can be found on http://supervisord.org, but most Linux distributions provide pre-built packages in their repositories. Supervisor itself is a daemon that is run by the system's process management so it gets run by init or it's counterparts. 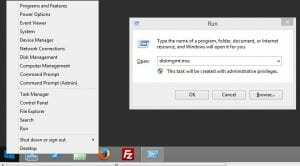 To run your own program, you have to add it to supervisord's configuration and it will make sure that it gets started on boot and restarted in case it crashes. GIGA V-Servers are called VPS from now on! Effective of today we change the official name for our virtual servers. Our offered hosting solution V-Server is called VPS from now on. VPS is the shortcut for Virtual Private Server. After long consideration we have decided on a name change, because our experiences have shown that our customers prefer the more common name VPS, also in their correspondence with us. You, as our customer, are not affected by this modification, nothing besides the name changes for you. Please note that the invoices you are receiving from us bear the new product name from now on. V-Servers now equipped with more power! While super models are presently strolling down the catwalks in TV-shows true beauties can still be discovered at our company. Giga-International.com had not been afraid of any expenses and efforts to present their top notch virtual servers „L“ and „XL“ even more attractive on the virtual catwalk, starting today. So we have silently boosted the hardware of our hostsystems during the past couple of weeks to present you here and now with an upgrade which does all honour to haute couture in Milan and Paris. Giga-International presents: The GIGA virtual servers in a new outfit! Go ahead and order our even more attractive top models now, the GIGA v-servers M, L and XL! As of today, Giga-International.com is presenting their official website on FACEBOOK. Like in our company blog, we would like to use this platform to inform all interested folks specifically about our products, new developments, some interesting details about our day-to-day business and, not to forget, about ourselves. In addition, you can post your comments regarding our input via your regular FACEBOOK account. That way, you can communicate with our staff nearly “face-to-face”. We are looking forward to receiving your feedback, your proposals and your opinion in general with regard to several topics – even apart from the hosting environment. Giga-International's entire team is contributing with news and status reports on FACEBOOK, to provide you with an open minded view on our own ideas and perspectives. It’s about time: Our V-Servers are finally available for international customers! We've invested countless hours during the past few months and we haven’t been afraid of necessary expenses to provide you with a rock-solid product, paired with a great mix of technical features for a small price. According to our slogan “Think bigger, think Giga!” here they come! Giga-International V-Servers at an excellent cost-performance ratio. For only 9.99 EUR / month we provide a high-performance Intel-CPU with four cores, 2 GB of RAM – guaranteed! - and a hard disk of 100 GB. You need more power? Check out our V-Servers 'L' and 'XL'. They will definitely meet your requirements, that's for sure! With a guaranteed amount of RAM of up to 8 GB and 400 GB of hard disk space you definetly won't regret choosing Giga-International. Just like our dedicated servers, our V-Servers are connected to a 100 Mbps port paired with unlimited traffic. And, of course, you'll gain full root and administrator access to the machine installed with an operating system of your choice. And there is something more to complete this 'all-in-one-package': Our great customer support, available 365 days a year, even on holidays and on weekends, from 8 am to 11 pm (available by telephone or e-mail), is included! During market launch only: Order your new GIGA V-Server today and your virtual machine will come without a setup fee!